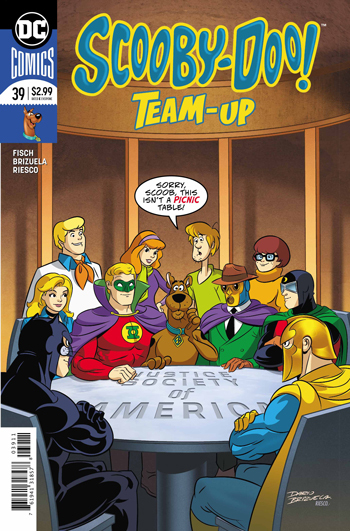 Scooby-Doo Team-Up operates in the spirit of the old Scooby-Doo Movies TV series, with the Mystery Inc. kids investigating ghosts and fighting evil alongside DC heroes and other Hanna-Barbera characters. Issue #39 sees the gang spirited back in time by Doctor Fate to team with the Justice Society of America in order to learn how to defeat a band of ghosts released from Pandora’s Box in the present. It turns out the ghosts were released in 1942 by a Nazi-aligned Vandal Savage, forcing the JSA and the original Scooby gang to leap into action and split off into groups of three to foil his plans. Regular creators Sholly Fisch and Dario Brizuela present a fast-paced story bursting with action and handsome renderings of the JSA, true to the Hanna-Barbera style. The iffiest thing about this book is the use of Nazis as cartoon bad guys, especially considering current events. A scene where the heroes advocate for unity in the face of hate is a welcome touch, but perhaps more gravity is required given the subject matter. If that isn’t quite a concern for you, then Scooby-Doo Team-Up #39 is a fine comic, stuffed full of humor and classic superhero action.